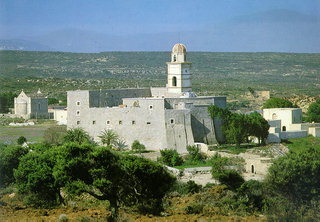 The Monastery is a stauropegion fortress. The main building of 800 m2 has three floors, which are divided into cells, guest - houses, kitchens, the abbot' s residense and warehouses. The katholicon is a two-aisled church; the northern aisle is dedicated to the Virgin, and the southern posterior aisle, to St John the Theologian. The monastery' s characteristic bell tower bears relief crowns and crosses with inscriptions and the date 1558. The 13th Ephorate of Byzantine Antiquities carried out works of consolidation and restoration. In the Monastery, there is also an interesting Museum.